Even though I've lived in Melbourne for most of my life and I love to eat so read up about many restaurants, I'm still forever being surprised by great restaurants hidden amongst one of Melbourne's many laneways. Portello Rosso is such a restaurant, and my friend Hien has been raving about this restaurant to me for ages. We finally met up to eat there when she could squeeze me into her busy jet setting career. We went on a Sunday night and had the banquet meal. I think the cheapest banquet (which was $40 when we went but is now $42) is only available on Sunday, but I may be wrong. I think this banquet is more than enough food and it's insanely good. We start the meal with some fantastic garlic bread, where you rub the garlic in oil into the bread yourself. Lovely marinated olives also accompanied the bread. I'm not a big fan of olives so let Hien eat most of that. 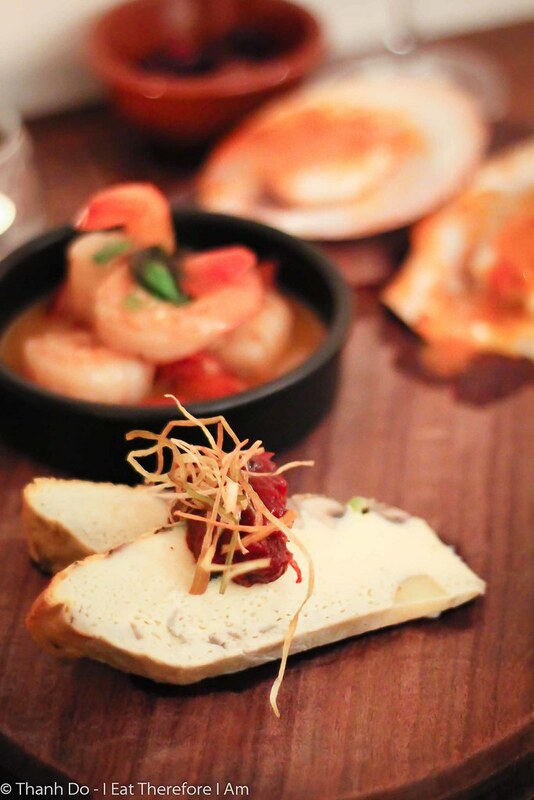 Entree were classic Spanish tapas of Tortilla, Prawns in Oil and Grilled Scallops. All were great, especially the prawns and I don't really like prawns that much. Beautiful massive Meatballs (2 each *snigger with childish laughter*) and the most moreish Pumpkin and Beetroot Salad were next up. By the time I finished these two dishes, I was getting quite full already. But there was much more yummy food to come so I pushed on as the next dish was Pork Belly. 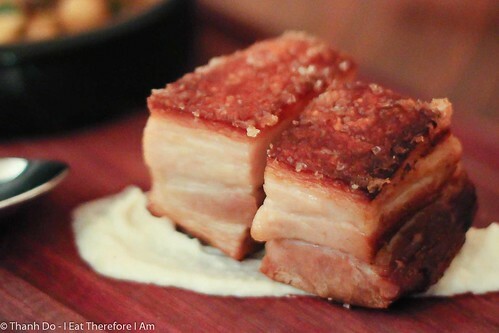 And these pork belly were super moist and crispy, served with a almond and garlic puree. On the side, there was also a brilliant Potato Bravas. 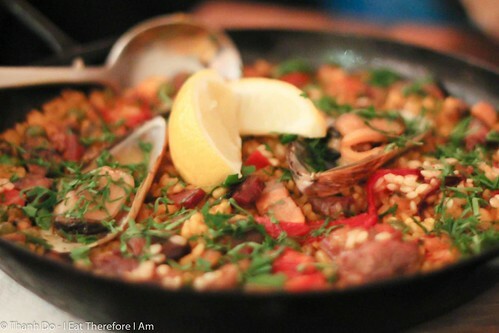 By this point I thought I was completely done, but then this ultra fragrant Seafood Paella arrived. Somehow I managed to push on...AGAIN...and eat almost half of this wonderful paella. The rice was just the right consistency and had the crispy bits at the base which I love. There were nice chunks of seafood and meat mixed through it. Thankfully, while the rest of the meal was paced quite quickly (we were on a 2 hour sitting), the dessert was delayed for a bit to let all the wonderful food settle. The dessert that arrived was some simple churros. I really love churros but don't find too many good ones around Melbourne. 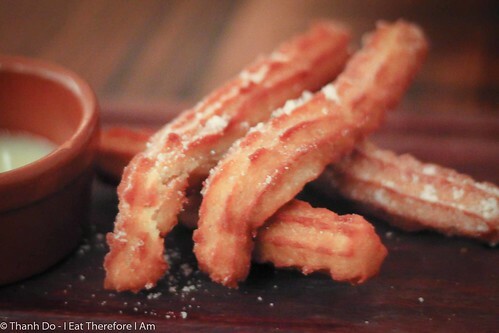 I would have to say that these are the BEST (yes, big call) churros I've had in Melbourne. They were so crispy and soft inside. The flavour was just that perfect golden brown (if you could taste a colour that's what these taste like). And while most places serve a dark chocolate sauce for churros, this thin white chocolate sauce was stunning. We were seated upstairs in this cosy nook and I loved it. Although it was cramped up there, I loved the atmosphere and it felt like I was eating in a small tree house with the sloped ceiling. The waitress we had was very friendly and joked and laughed with us while efficiently removing our dishes. She even helped us select the sparkling cider which was awesome. I wish I remembered the name of that cider. I would happily recommend Portello Rosso as the dishes I tried were all excellent in flavour and perfectly cooked in texture. With drinks included, the meal only came to $50, which is a great price. Overall Rating: 16/20, Beautiful simple Spanish food done extremely well. Scores: 1-9: Unacceptable, don't bother. 10-11: Just OK,some shortcomings. 12: Fair. 13: Getting there. 14: Recommended. 15: Good. 16: Really good. 17: Truly excellent. 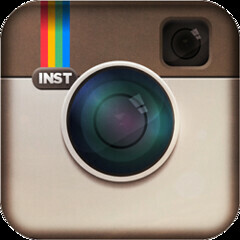 18: An outstanding experience. 19-20:Approaching perfection, Victoria's best. Aww, sounds like a good cheap eat! I hadn't heard of this place before. I love this place and raves about it. And I love the fact that it is tucked in a little laneway. And how small is the kitchen but produces great food. Betty, pork belly was super amazing. Michelle, you gotta go go go. Ashley, I think there are more and more Spanish places popping up everywhere because Melbournian's love the stuff. Penny, I do love how it's so hidden. Those churros look awesome! Intrigued to know what the white chocolate dip would taste like.